How Can I Find Out if DSL Is Available Near Me? DSL (Digital Subscriber Line) high-speed internet service exists in many areas, but due to technical factors, DSL coverage is limited and therefore not available everywhere. If you're looking to get DSL, you can use a special tool, often called a DSL finder or DSL locator, to see if DSL is available in your area. To see if DSL is available at your location, you can normally enter that location, or a local phone number from that area, into an online DSL lookup service. Allconnect: Enter the address where you want service and get a list of DSL providers. BroadBandNow.com: Enter your ZIP code and compare prices of nearby providers. FCC.gov: The Federal Communications Commission has a Fixed Broadband Deployment tool that can be used to find providers around a specific address, complete with their last reported maximum download and upload speeds. HighSpeedInternet.com: This is another option for finding DSL internet providers in your area. These online services report the status of internet service in your area and are usually pretty accurate. However, take note that the features and prices you see might not be 100% correct. Once you find a company that delivers DSL to your area, always check with the provider directly for more details. If the DSL lookup indicates that service is unavailable in your neighborhood, it's entirely possible that service was very recently established, like in the last few weeks or so. Of course, the DSL search tool might also just not have a smaller company in their database, in which case you won't see it in a search. In most cases, you can also determine a company first and then use their website to see if they offer DSL where you live. Verizon: Click the Check availability button next to any of the plans on that page to see if Verizon offers DSL in your area. Just enter the ZIP code where you want to access DSL. AT&T: Call the phone number on that page to request AT&T DSL information for your area. CenturyLink: If you think you want DSL from CenturyLink, follow that link and type your address into the text box to see if they can provide you with internet services. Frontier Communications: Use Frontier's service provider search tool to see if you can buy DSL where you live. Windstream: Enter your address when asked to, and you'll be shown whether DSL is an option at your address. MegaPath: Do a search on MegaPath's website to see which services of theirs are available where you live—Ethernet, T1, DSL, or cable. To be eligible for DSL service, your phone line must be qualified by the service provider. This is a process that the provider and their technicians complete when you first sign up for the service. A few technical limitations can prevent your residence from qualifying for DSL. DSL technology is distance sensitive. In short, it means your residence must be located within a certain distance (traditionally about 18000 ft. / 5 km) away from the local phone company hub (called a central office or public exchange). In rare cases, your neighbor around the corner may be eligible for DSL but you cannot, due to this distance limitation. This is also why people living in rural areas cannot subscribe to DSL service. Some low-level technical details outside of your control determine whether or not a telephone line is of electrical sufficient quality to support DSL. These include the existence of load coils. A load coil is a small electrical device that improves the ability of the line to transmit the human voice. Telephone companies installed these devices on lines over the years to improve the quality of their service, but ironically, while load coils work effectively on the low (voice) frequencies, they adversely affect the high (DSL data) frequencies. DSL service generally does not work over load coils. 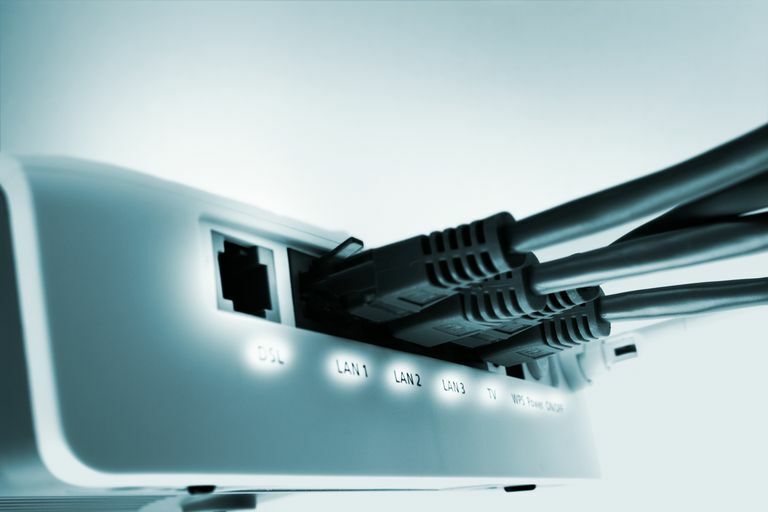 The network bandwidth you'll enjoy with DSL also can depend on the service provider's telephone wiring. The longer the line between your residence and the service provider's hub, the less bandwidth DSL can support. Likewise, its thickness (wire gauge) can affect performance—your neighbor down the block may experience faster (or slower) DSL internet connections for this reason. The maximum bandwidth of Asymmetric Digital Subscriber Line (ADSL) available for internet downloads based on length of phone wiring is shown below. Data rates are provided in units of kilobits per second (Kbps). 6,312 Kbps up to 12,000 ft.
2,048 Kbps up to 16,000 ft.
1,544 Kbps up to 18,000 ft.
As the length of phone wire increases, availability of DSL bandwidth decreases for both uploads and downloads. The example shown above is based on 24-gauge wiring; performance decreases further if 26-gauge wire exists on the loop.